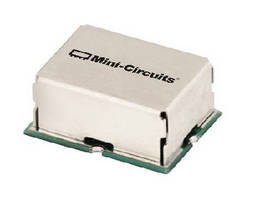 Mini-Circuits, global leader in RF & microwave components, continues to add to its industry-leading mixer lineup, releasing 8 new HJK and LAVI designs with third-order intercepts as high as 33 dBm, and L-R isolation up to 55 dB! Suface mount mixers with frequency ranges vary from 235 MHz to 4.5 GHz, meeting specific industry needs at LO power levels of +13 to +23 dBm. For example, the LAVI-452VH+ is a dual double-balanced FET quad design ideal for broadband wireless 4G and other systems, covering signals from 3.22 to 4.5 GHz with an IP3 of 33 dBm typical! This model also features a high input power 1-dB compression point of +20 dBm, and excellent isolation, both L-I (40 dB) and L-R (45 dB)! Another new model, the HJK-172H+, is a double-balanced FET design covering frequencies from 1250 to 1700 MHz with a typical IP3 of 33 dBm and good L-R isolation of 45 dBm typical. It also has an input P1dB of +20 dBm, in this case 3 dB higher than the rated LO power! For more engineering and design information on our new HJK and LAVI high-IP3 mixers, and all the rest of our newest products, just go to the New Product Announcements section at www.minicircuits.com!